Redlining is alive, well and dangerous in Detroit. As a young married couple, Steven and Corey Josephson chose to begin their lives together in Detroit. They came from Greeley, Colorado, a city that couldn’t be more different. It was founded as an experimental utopian community; its majority-white population has more than doubled since 1970; and its unemployment rate is lower than the national average, and about half that of Detroit. But in August 2014, they left. Corey, a theater and English teacher, grew up in Michigan, and Steven found a position in Detroit’s Teach for America program, teaching science to the youngest kids at Coleman A. Young Elementary School. Along with their beagle, Baley, they moved into a house in northeast Detroit near 8 Mile Road. “We loved the house, we loved the neighbors,” Steven Josephson says. They were renting, but “homes are just so cheap here, it makes more sense to buy.” So they approached their landlord about purchasing the home. At first, everything moved smoothly — but then, Josephson said, the landlord backed out. “He bought the house originally for $40,000, but home values are not even close to that,” Josephson says. 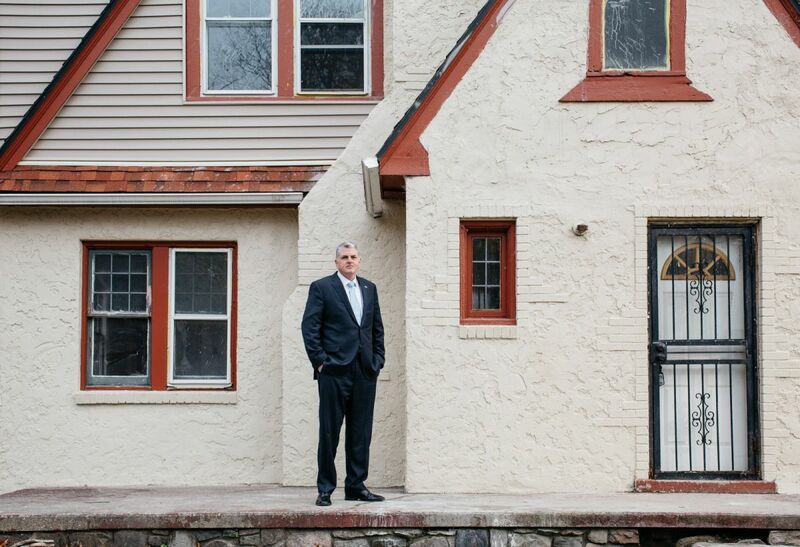 “He wanted $35,000 for the house, even though it wouldn’t appraise higher than $30,000. And besides that,” he adds, “he was enjoying the additional income from renting it out.” And so, in a city with an infamous surplus of homes, the Josephsons had to start from scratch. Two different stories are playing out in Detroit — though they seem like they should contradict each other. There is the “Midtown story,” the tale of select neighborhoods where the narrative is about revival. Historic residences in Detroit’s most gracious communities are asking for eye-popping prices: $749,500 and $530,000 in Indian Village, $1.55 million in Palmer Woods, $500,000 in Lafayette Park, $80,000 for a high-rise condo in Harbortown, $1.125 million for a downtown penthouse. Over the last decade, home values have nearly doubled along the Woodward corridor, which cuts through the center of the city, and they’ve increased by nearly two-thirds on the eastern riverfront. HGTV star Nicole Curtis is diligently reviving several classic Detroit homes for her show “Rehab Addict,” generating excitement for the potential of investing a little hard work and creativity into the city’s real estate. “Move to Detroit” is the hip mantra echoing in New York City, Houston and well beyond, inspiring not a few enterprising locals to pen guides for newcomers. Even Brooklyn’s groundbreaking Galapagos Art Space is lifting up its massive operations and moving to Detroit. The swift uptick of interest in a city that’s scarcely emerged from bankruptcy is igniting passionate debates about gentrification, or how the city should adapt to new residents without slamming the door on long-timers. But at this point, at least, there’s room for everyone. Twenty square miles of land is entirely vacant. There are about 70,000 abandoned buildings, and, since 2005, one in three properties — most of them houses and most of them now blighted — have been lost to foreclosure. Across vast swaths of the city, this is not a story of revival; it is a story of war. The economic battles are manifested in swiftly deteriorating homes, scrapped of water heaters, furnaces and plumbing. Exposed to the elements, the historic molding absorbs moisture and crumbles. Animals take shelter inside their walls, or squatters, or drug dealers. Or all three. Should someone take an interest in buying one of these homes, it might be priced as low as $500 or $1,000. That’s a loss for the seller; average home sale prices in Detroit have fallen nearly 28 percent since 2006. But it’s not necessarily a great deal for the buyer either. The title may come with a forbidding burden of back taxes and water bills. And the cost of rehabbing these cheap houses and making them livable can range from $50,000 to $90,000 for a small bungalow. Renovation will cost more than these homes will sell for. The story of war ends — so far — in one of two ways. Nobody takes on the underwater economics of purchasing these homes, so the city is left with the burden. Left vacant, a house will disintegrate with astonishing speed, endangering nearby residents until it must, finally, be destroyed. About 40,000 homes in the city are currently recommended for demolition — half of what was estimated in 2014, but still an astonishing number. Or perhaps there is someone who wants to buy the home. Maybe the architecture or the neighborhood culture romanced the prospective buyer. They may have family history here, or a desire to put a stake in an emerging city. They plan to live in the home long-term, so immediate for-sale prices aren’t a concern. In this case, in all but a handful of Detroit neighborhoods, you better have cash on hand for both the purchase price and the tens of thousands of dollars of rehab work. Loans here are nearly impossible to find. In Detroit, there were 3,500 sales of single-family homes in 2014. Only 462 of them received a mortgage. That means that nearly 87 percent of sales were in cash — and that doesn’t include homes sold in foreclosure auction. Comparatively, the overall metro area saw only 53 percent in cash sales the same year. Nationwide, it was 43 percent. “The number one issue that we, in the end, identified in Detroit is that it’s incredibly hard for homebuyers to get a mortgage right now,” say Svenja Gudell, chief economist with Zillow. The 2014 numbers weren’t an anomaly. Zillow’s data shows that only 529 properties in Detroit were purchased with a mortgage in 2013 — up from 318 in 2011, but down from 772 in 2009. Of those 529 mortgages, more than one-third were made in just four ZIP codes (48126, 48226, 48201 and 48207), encompassing Downtown, Midtown, Corktown, Lafayette Park and adjacent neighborhoods. Detroit has 46 ZIP codes in all. One of the most sinister legacies of urban development — redlining — is making a de facto reappearance in Detroit. The housing market is set up to invest in some neighborhoods, and not in others. Even in a city that is 83 percent African-American, and where the median income is under $30,000, home purchasing favors those with liquid cash assets. That is, people who, disproportionately, are upper-income and white. Of the 462 mortgages in 2014, 364 went for homes that cost more than $52,000, even as the average house price varied between about $32,000 and $40,000. In 2013, 35 percent of mortgage applications were submitted by black applicants and 25 percent by white applicants. According to Zillow, black applicants were six times more likely to be denied a mortgage due to poor credit than white applicants. The foreclosure crisis hit the Marygrove neighborhood hard. At a glance, Marygrove doesn’t look like the typical casualty of the 2007-2009 mortgage crisis. But if you walk along its leafy streets, you begin to notice the boarded homes and overgrown shrubs. While more than $9 billion has been invested in greater downtown real estate since 2006, this neighborhood about 11 miles from the city center is still struggling with foreclosures. In the 48221 ZIP code, which encompasses Marygrove, 623 foreclosed properties are currently on the market. 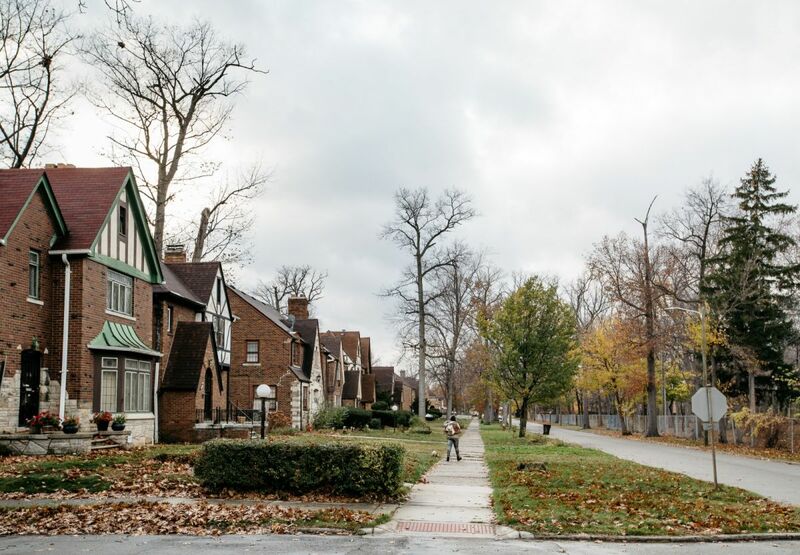 In Detroit, Marygrove is known as a tipping point neighborhood, one that may be able to get back on its feet after a bruising few years. Or not. What happens now depends on solving Detroit’s redlining problem. Redlining is typically understood as the practice of denying access to home mortgages in certain areas to whole classes of people based on their race or ethnicity, and segregating them into less desirable areas. In today’s Detroit, the phenomenon plays out differently, but the social impacts are no less intractable. Instead of an overtly racist and classist policy rendered with a boundary slashed across a map, it manifests as a cascading series of obstacles that become apparent to a prospective homeowner when he or she approaches a bank to take advantage of what seems at first to be a buyer’s market, open to anyone willing to invest in a rebounding city. The problems don’t end there. This can turn into an appraisal that is lower than the agreed-upon price, which usually torpedoes the mortgage and the sale. The low appraisals also lead to a problem for owners who want to stay in their home but need to access equity to make improvements. When such an owner goes to refinance at the bank, they find that their $140,000 house is now valued at $17,000 — and there is no equity for them to access. This harms the individual, and further deteriorates the value of the home, setting the stage for the nearly inevitable cash sale at a low price if the owner does ultimately choose to put the house on the market. The alternative scenario — the appraiser recognizing a house’s true value and appraising it for higher than comparable sales — doesn’t guarantee a smooth process either. If an appraiser values a house at $55,000, when several similar houses on the same street recently sold for $1,000, he has to justify it in a way that withstands scrutiny from federal regulators who have never seen the house and are relying wholly on quantifiable data to support valuations. For an appraiser, it’s much easier to not do the extra legwork, even if it will bring in lower home values and blow up a home sale. Pan out a little bit, and you’ll see what that looks like. 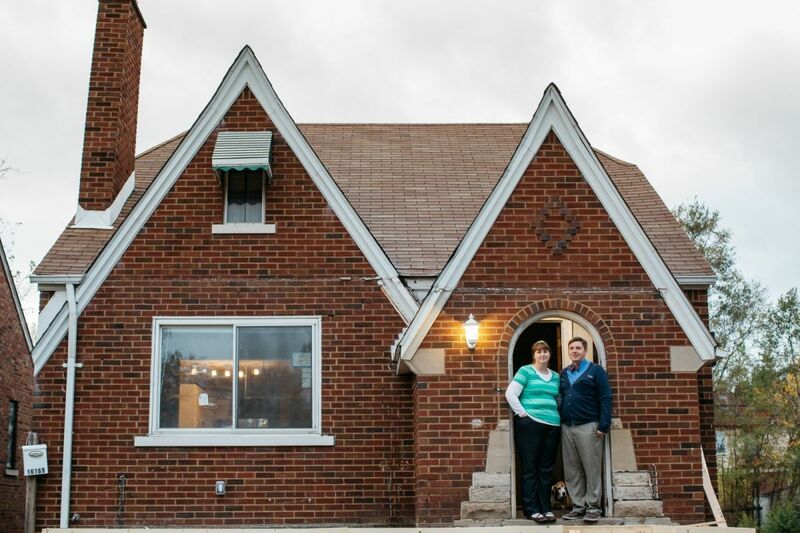 In Ferndale, the bedroom community that neighbors Detroit across 8 Mile Road, a 1,300-square-foot frame house on West Hazelhurst recently sold for $231,000 with a conventional mortgage. Less than a mile away — almost within the distance that could be counted as a comparable price for an appraisal — a cash sale in Detroit for a 1,624-square-foot home went for a mere $35,000. Meanwhile, over on Detroit’s Balfour Road, a stately, 1,865-square-foot white-shuttered brick home sold for $20,000 in a recent cash sale. Ten blocks away, in Grosse Pointe Park, a 2,280-square-foot home with vinyl siding closed at $90,000 in a conventional mortgage. Today, there may not be any maps inked with an official red line that divides the city from the suburbs, or one neighborhood from another, but the fact that people can’t secure mortgages across huge swathes of the city is just as detrimental. The result is a system where loans are not available across most of the city. In Detroit, only 12 percent of home sales are financed, compared to 65 percent in Ferndale and 90 percent in Grosse Pointe. And they are not all at those infamously low price points. An $87,000 house in the Woodbridge neighborhood was recently bought with cash. So was the $1.6 million Fisher Mansion in Palmer Woods. How do you measure risk? What is the value of a home? These questions become thorny when they overlap with seeing more value in some people than in others. The Home Owners’ Loan Corporation was created in 1933 to stabilize the national housing market, which had been decimated by the Great Depression. It did this by refinancing mortgages to stave off foreclosures, and also by creating “Residential Security Maps” for 239 cities. The mapping project was designed for lenders to gauge the security of their investments. It effectively codified the longstanding practice of redlining and locked in discriminatory patterns of urban development before finally being struck down by the Fair Housing Act of 1968. Nine years later, urban civil rights activists won another victory with the passage of the Community Reinvestment Act of 1977, requiring all banks to apply the same lending criteria to all potential homeowners. But by creating a structure for urban segregation, redlining unleashed a poisonous legacy that still sickens today’s cities. And more covert methods of “redlining” have been revealed by court challenges ever since. In June, the U.S. Supreme Court determined that under the Fair Housing Act, good intentions aren’t enough. Lending practices that are not discriminatory in intent can still be discriminatory in practice — and businesses can be held legally accountable for them. Today’s Detroit — where mortgages are rare and the market favors people with liquid cash — is a landscape of distorted opportunity. The city needs interrupters to break the pattern. That’s where Talmer Bank comes in. “Frankly, we’re very big fans of Mayor [Mike] Duggan,” Patrick Ervin says. The bank supported the mayor’s 2013 campaign and, once he was elected, it asked him what they could do to promote his agenda. Duggan pointed to the Marygrove neighborhood and asked this for-profit bank to adopt it. Talmer has an unusual story. It was founded as a micro-bank in 2007 — “absolutely the worst possible time to start a bank, you would think,” says Ervin. But because it started off without any bad loans on its books at a time when competitors were keeling over from the weight of them, Talmer had different opportunities. By the time Detroit became the poster child for the national housing crisis, Talmer began buying failing regional banks, aided by $200 million raised from Wall Street investors. It picked up Citizens First in Port Huron, Michigan, in April 2010, just as it was about to become the largest bank failure in the state’s history. A year later, Talmer bought four more banks. By keeping local operations alive, Talmer rapidly expanded its footprint. It went from 29 employees to almost 800 in about 12 months. “It’s more fun to tell the story than it was to live it,” Ervin says. It was challenging to bring together different work cultures, and Ervin felt acutely that he was putting his family’s money on the line by betting on both banking and Detroit during their respective years of crisis. But today, Talmer Bank, based in Troy, is the third-largest bank in Michigan. And it is profitable. In the first phase of its work, the bank took 17 people who won bids on Marygrove homes through Land Bank auctions and gave them $25,000 for rehab work. (Talmer underwrote the mortgages for five of them.) “We don’t just give the check, but we dole it out as work as done and we pay for it as a forgivable grant,” Ervin says. “They just have to fix it up and live in it.” The initiative was supported by the mayor’s office, which simultaneously began eyeing 78 vacant Marygrove homes. The city sued their owners for nuisances and code violations. In some cases, this incentivized owners to make urgent repairs. In others, it was the first step for the city to seize control of property that had been wholly abandoned, and, through the Land Bank, transfer it to someone who will take care of it. Steven and Corey Josephson bought one of the Marygrove houses that came with a $25,000 rehab grant — a brick bungalow built in 1930. The house had scared off other potential buyers, Josephson says, because the previous owner had begun renovation. It was essentially “brought down to the studs.” But the Josephsons saw potential. They loved the kitchen, they were eager to garden in the yard, and the neighborhood character charmed them. In May, they closed for $43,000, with a mortgage underwritten by Talmer Bank. Under the guidance of the nonprofit Southwest Housing Solutions, which manages the Talmer program, they hoped to finish the rehab over the summer and move in before the school year began. The bank, Southwest, and the contractor gave them every assurance that this wouldn’t be a problem. Corey and Steven Josephson in front of the home they bought in Marygrove. There were a slew of reasons for the numbing delays. The mortgage took time to finalize because Talmer spent extra time on the details, aware it was building a precedent. They also hit a snag with the title — it still had a tax lien on it — and then another difficulty when Steven’s employment verification from Detroit Public Schools was stalled. The day of the closing, the Josephsons learned they needed to raise their fire insurance rate. And only one contractor bid on the work for the house. This was the first rehab house they’d done, which slowed things down and stunted quality. And last month, left sitting in an unoccupied house, the furnace and hot water heater were stolen. For all the ups and downs, though, “there wasn’t any backing out,” he says. “We love the house.” The home is now about 95 percent complete. It still needs electrical work, drywall touch-ups and other work, some of which “we will do ourselves in our spare time.” And they’re making the place their own: They bought a claw-foot tub for the main bathroom. Ultimately, what got them through the arduous process was plain old commitment. “We bought a house,” Josephson says. “We’re not going to return it. Talmer also took some lessons from their pilot program. Namely, even when rehabs are complete and buyers are living in the homes, one of the most urgent outcomes is still left undone — there’s no increase in value for other homes in the same neighborhood. Occupied, fixed-up homes are a definite boon for the community, but the market only sees the increased value of a home when another sale happens. “The only way in real estate to show demonstrable value is to show what someone else is willing to pay for it, and what some bank will finance,” Ervin says. Patrick Ervin in front of one of the Marygrove homes that Talmer Bank is rehabbing and hoping to then sell to a mortgage-financed buyer. Talmer isn’t the only interrupter in Detroit. The AFL-CIO is partnering with the Land Bank to rehab 300 homes, using union labor, in four different neighborhoods. In its Rehabbed and Ready program, Quicken Loans is working with Home Depot and the Land Bank to do a similar thing in the nearby northwest neighborhood of Bagley. By investing $5 million to renovate and sell 65 formerly abandoned homes, the Rehabbed and Ready initiative means to shake out artificially low home sale prices and spur lending in Detroit. When the first homes went up for auction, they sold for prices ranging between $45,600 and $56,600 — barely more than the initial asking prices but far higher than other recent area sales. The Land Bank also has a line of specialized loan products tailored for properties in a city where there are a lot of distressed cash sales. Mends-Cole cites Liberty Bank, Charter One and Huntington Bank, alongside Talmer, as other lenders who have taken steps to address the problem. There is an obvious element of self-interest here on the part of these banks. They would like it if homebuyers in these programs get mortgages through their own companies, though they cannot require it. And by generating higher sales, they hope to raise the appraisal values of homes they mortgage on the traditional market. That said, almost by definition, to be an interrupter is to lose money. If it didn’t, the profit-seeking housing market wouldn’t need them in the first place. “Someone’s got to take it on the chin to get [the market] functional again,” says Ervin. Lenders willing to invest money in kickstarting Detroit’s housing market are not the only weapons in this war. The Community Reinvestment Act, enforced by the U.S. Treasury, is another. It defines geographical areas using Census data where there are low levels of lending. Banks must lend a certain amount of money in these Metropolitan Statistical Areas (MSAs). But in Detroit, this tool is dulled by a strange technicality. Detroit is in an MSA that includes the suburban cities of Livonia and Warren, which means that banks can use all their CRA credits outside the city. The very instrument meant to catalyze lending in Detroit amplifies the inequities between it and its neighbors. In places where the MSA borders are tightly drawn, the CRA is more effective. Edits to the border lines can only be done once a decade, when they are evaluated three years after each Census. In 2013, Flint, Michigan, seized the opportunity to get its MSA borders properly tailored in relation to other communities in the county. Now that the borders accurately reflect the need, the city can leverage more investment in its housing market. Detroit was in the throes of bankruptcy and emergency management in 2013, and it missed its most recent chance to get its MSA borders redrawn. Its next chance to do so will be in 2023. Forward-thinking lenders can also act by raising their appraisal rates and using in-house professionals who are familiar with the local market, especially in cities that are operating outside the traditional rules. For instance, Talmer issues its loans with an innovation that could help other troubled markets: an in-house appraisal team. Most lenders find their appraiser through a management company that takes a cut of the appraisal fee paid by the buyer. But to ensure the best person possible handles each assessment, Talmer works directly with a regular pool of appraisers who receive an above-average fee in part because the middleman has been cut out of the process. “If we demand more, then we better be able to pay more,” Ervin says. But even Ervin admits that Talmer’s efforts represent just the start of what will need to be a major change in the way the residential real estate market operates in Detroit. Though home values in the city are appreciating, and at double the rate of the national average, potential homebuyers can’t yet assume they will get financing. Unless more interrupters step up to break the pattern, it will not be inclusive of all. Anna Clark is a journalist in Detroit. Her writing has appeared in Elle Magazine, the New York Times, Politico, the Columbia Journalism Review, Next City and other publications. Anna edited A Detroit Anthology, a Michigan Notable Book. She has been a Fulbright fellow in Nairobi, Kenya and a Knight-Wallace journalism fellow at the University of Michigan. She is also the author of THE POISONED CITY: Flint’s Water and the American Urban Tragedy, published by Metropolitan Books in 2018. Michelle & Chris Gerard are photographers residing and working in Detroit. The passion they have for the city has led them to work with many Detroit businesses, non-profits, publications, and create storytelling images on a daily basis.